Autumn is here, and with it comes the time for baking delectable fall goodies-- treats made with sweet pumpkins, crunchy apples, and savory spices. One of my favorite things to bake at this time of year is Pumpkin Bread, a delicious bread filled with cinnamon, nutmeg, ginger, and cloves. 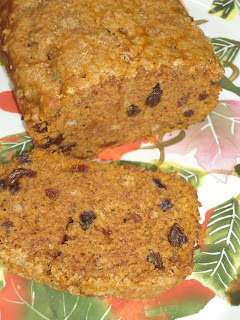 Here is the recipe for my favorite pumpkin bread that uses Ener-G Egg Replacer instead of eggs. Preheat oven to 350°. Grease a bread pan and sprinkle cinnamon and sugar on the bottom and sides of the pan. In a small bowl, stir together Ener-G Egg Replacer and water. In a large bowl, sift together flour, sugar, baking soda, salt, and spices. Add oil, water, pumpkin, and egg replacer mixture. Stir in raisins. Pour into prepared pan. Sprinkle the top with cinnamon and sugar. Bake for 50-60 minutes. I didn't sample this particular one yet, but I am treated to Jessa's baking delights quite often, after church; and let me tell you---this girl can bake! Her carrot cake is TO DIE FOR! If Jessa made it, it's going on my plate--oh, and be sure to leave room for seconds!